MODERATE avalanche danger exists in near and above treeline terrain due to a wind slab avalanche problem. LOW danger exists in below treeline areas. Human-triggered avalanches remain possible today. Wind slabs remain prevalent on wind-loaded NW-N-NE-E-SE aspects in near and above treeline terrain. Over time these wind slabs should bond to the snow below them and become more difficult to trigger, but human-triggered wind slab avalanches still remain possible today. Settlement and consolidation may happen more slowly than normal due to the continued cold temperatures. Wind slab failures could still produce large avalanches. Many slopes where wind slabs exist also have large fragile cornices resting above them. These could break far from the apparent edge of a ridge. Maintain awareness of the conditions and terrain to identify where wind slabs may exist. Cornices above a slope, wind drifts/pillows, ripples on the snow surface, and other wind created textures can offer clues to help locate wind-loaded slopes. Less wind-exposed and/or lower angle terrain should hold softer less variable snow as well as safer avalanche conditions. * Observations yesterday from wind-exposed areas on Jakes Peak, Rubicon Peak, and Tamarack Peak found some signs of continued wind slab instability. On Jakes, some minor cracking occurred in wind-loaded areas near the summit, but ski cuts on wind-loaded test slopes did not cause any failures. On Tamarack Peak, longer skier-triggered shooting cracks (up to 20 ft) occurred on some test slopes. Cornices failed easily in this area. Again ski cuts did not cause any wind slab failures on test slopes. On Rubicon, some snowpit tests indicated instability in wind-exposed areas near the summit. * In sheltered near and below treeline terrain off of Spooner Summit, on Jakes Peak, on Rubicon Peak, and on Tamarack Peak yesterday, observers reported no signs of instability and data showed deep storm snow starting to settle and consolidate. Another few inches of snow fell over the last 24 hours. These snow showers should come to an end today as a high-pressure ridge builds over the region. The forecast calls for temperatures to remain cold. As the ridge builds, the winds may shift to the north along exposed ridgetops tonight, but the forecast calls for them to remain relatively light in most places. Expect clear weather through Thursday. 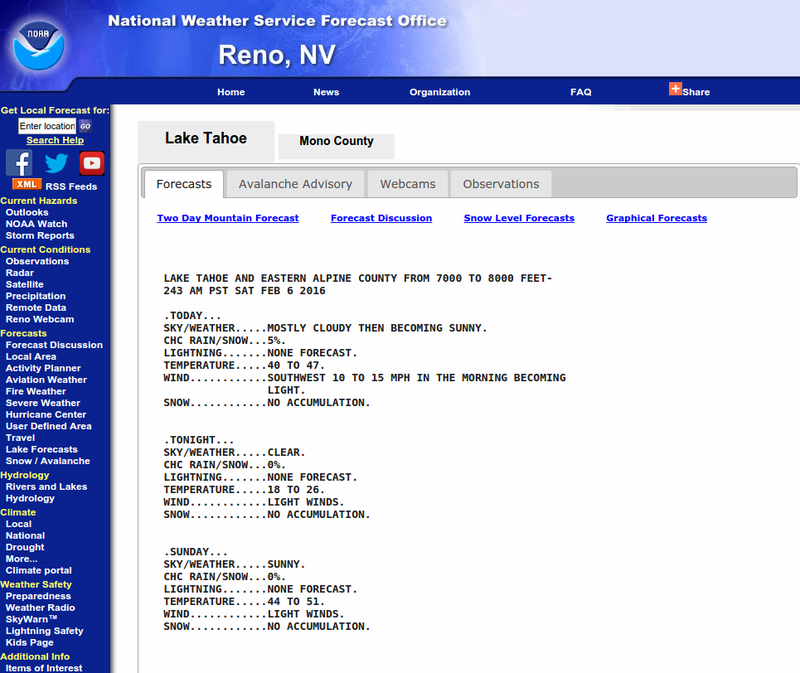 Weather observations from along the Sierra Crest between 8200 ft. and 8800 ft.
0600 temperature: 6 to 13 deg. F.
Max. temperature in the last 24 hours: 12 to 20 deg. F.
For 7000 ft. to 8000 ft. Weather: Mostly cloudy then becoming partly cloudy to mostly sunny. Isolated snow showers in the morning. Snow levels below 7000 feet. Chance of precipitation is 15%. Clear. Snow levels below 7000 feet. Chance of precipitation is 0%. Sunny then becoming partly cloudy. Snow levels below 7000 feet. Chance of precipitation is 0%. Temperatures: 20 to 25 deg. F. 4 to 14 deg. F. 25 to 30 deg. F.
Mid Slope Winds: West around 15 mph with gusts to 35 mph. Light winds. Light winds. Expected snowfall: No accumulation. | SWE = trace amounts. No accumulation. | SWE = none. No accumulation. | SWE = none. For 8000 ft. to 9000 ft. Temperatures: 15 to 20 deg. F. 4 to 14 deg. F. 21 to 27 deg. F.
Ridge Top Winds: West 15 to 30 mph with gusts to 50 mph. North 15 to 25 mph. Gusts up to 45 mph decreasing to 30 mph after midnight. Light winds becoming south around 15 mph with gusts to 25 mph in the afternoon. This avalanche forecast is provided through a partnership between the Tahoe National Forest and the Sierra Avalanche Center. This forecast covers the Central Sierra Nevada Mountains between Yuba Pass on the north and Ebbetts Pass on the south. Click here for a map of the forecast area. This forecast applies only to backcountry areas outside established ski area boundaries. This forecast describes general avalanche conditions and local variations always occur. This forecast expires 24 hours after the posted time unless otherwise noted. The information in this forecast is provided by the USDA Forest Service who is solely responsible for its content.